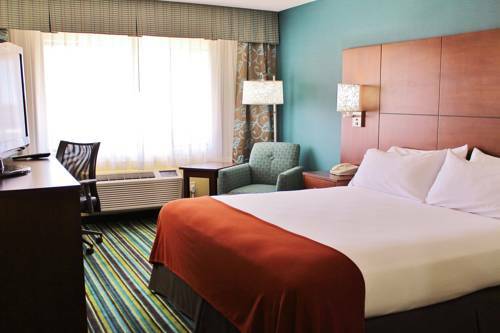 The perfect escape from big-city stress awaits you at the Holiday Inn Express Flagstaff, AZ hotel. From watching the stars in the sky to visiting the many natural wonders around northern Arizona, we are your center for fun.If you're looking for hotels in Flagstaff look no further! Conveniently located off Interstate 40. We have tons of activities nearby including Lowell Observatory, where Pluto was discovered. We're minutes from downtown Flagstaff, Historic Route 66 and Northern Arizona University. Take a short drive to catch breathtaking views from the San Francisco Peaks or through Oak Creek Canyon to Sedona. And of course, there's the must-see Grand Canyon!No matter what brings you to our hotel's accommodations in Flagstaff, we aim to satisfy your needs. Your day begins with the unbeatable free Express Start Breakfast Bar. After a great work out in our new 24/7 Fitness Center you can keep connected with our free Wi-Fi access. Whether you want to relax in the shade or soak up the Arizona sun, our hotel has you covered with our relaxing heated pool and spa. You can always count on our great customer service when you "Stay Smart"! Grand Canyon Room: You will find our Grand Canyon Room ideal for board meetings, banquets, training sessions or seminars. We pride ourselves on our attention to client satisfaction through personalized service. Our staff is ready to accomodate your needs in every detail. Flagstaff Amtrak StationThe Flagstaff Amtrak Station route runs from California to Chicago. The train has 5 stops that include: Los Angles, CA; Flagstaff, AZ; Albuquerque, NM; Kansas City, KS; and Chicago, IL.